The Grade II* listed Hampstead Synagogue was built in 1892 by architect Delissa Joseph, and was originally used as a place of worship for the largest Jewish population in London. The front, of high significance, is the only elevation that can be seen on this landlocked site. The interior is important for fittings that express its rituals and also the use and expression of its space. But the crowning glory of the building, are its sublime stained glass windows. The restoration project started in 2005, when the building had deteriorated due to lack of maintenance and simply, old age. Repair and restoration of the building and provisional of community facilities started in 2008 and continues. A Heritage Statement (comprehensive of: Historic Appraisal and Significance Assessment of the building; Schedules of Works and PPG15 Statement) lead to a successful Listed Building and Planning Consent in 2005. The total cost, exceeded £3 million, has allowed a comprehensive restoration and reconditioning to take place. “The original roofs were poorly designed from the start and all leaked like a sieve,” said the architect, Stephen Levrant, “ the slates, lead-work and cast iron gutters were completely replaced and fitted with insulation and ventilation, but we meticulously had to keep everything looking exactly like the original”. Large areas of plasterwork had to be replaced after water ingress and rot caused damage over many years. The repairs and replacements were carried out using traditional lime plaster. Complete new heating and lighting systems. The main lighting was designed by Bruce Kirk of Light Perceptions and is based upon the original fittings of 1902, using traditional materials, but designed to provide high quality levels of illumination throughout. The incredible stained glass is now illuminated by specially positioned external lights which enhance the glass so that it glows magically in the evening. 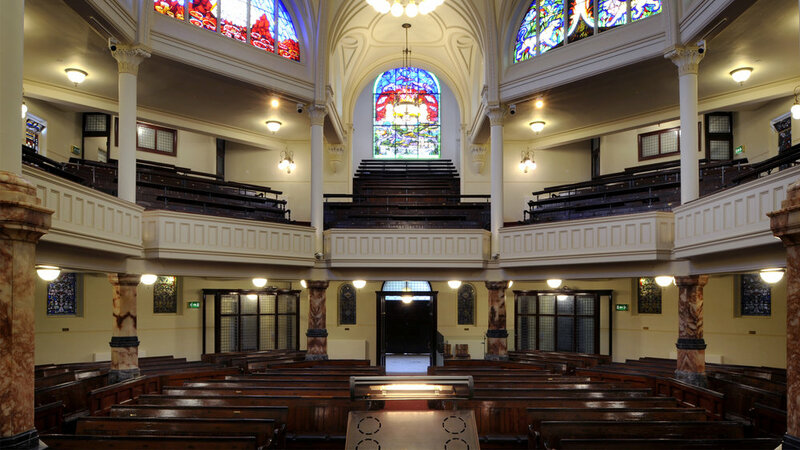 The main synagogue has been redecorated in a historic colour scheme based on documentary evidence.